NEW ORLEANS – Anthony Davis put the ball on the floor, and for the New Orleans Pelicans center it only takes one or two dribbles to get from the perimeter to the rim. That’s why on Easter Sunday, Thunder guards like Russell Westbrook were quick to snap into the lane, derailing those long dribbles by sticking a hand in as the ball bounced high back up to Davis’ midsection. The result was a disruptive defensive performance by the Thunder to force 21 turnovers, and eventually a 109-104 victory. The Thunder had three previous cracks at this type of game - a scrap-and-claw battle between two Western Conference foes in practically must-win situations to secure playoff berths and positioning. Head Coach Billy Donovan and his squad made sure not to let this fourth one slip away, getting high quality shots on most possessions and making enough defensive stops to seal it. “At this point we gotta start shaping up and playing better towards this final stretch, and I thought we did that to close the game out,” said forward Paul George. New Orleans jumped out to an early lead with a 16-0 run midway through the first quarter after Carmelo Anthony picked up his third quick foul. The Thunder responded to start the second quarter, however, when Paul George started really going to work on offense with a burst on his first step and some slick ballhandling that helped him get all the way to the rim. The pace was high and the Thunder ripped off a 22-7 run to get back into the game. George was a major catalyst, scoring 19 of his 27 points in the first half. Donovan utilized a new rotation pattern that featured George coming out at about the 5-minute mark of the first quarter for a quick breather, and then out for another quick stint in the second quarter, and George ended up playing 36 minutes, and the pattern seemed to work out nicely to make sure either he or Westbrook were on the floor at all times. George went through a cold spell after halftime, shooting 1-for-8 in the third quarter after going 7-for-14 in the first half. But when it counted late, with the Thunder up just 5 with 1:18 to go, Westbrook found George in the right corner, directly in front of the Pelicans bench, and the All-Star small forward splashed a three-pointer to create enough breathing room to safely close out the victory. 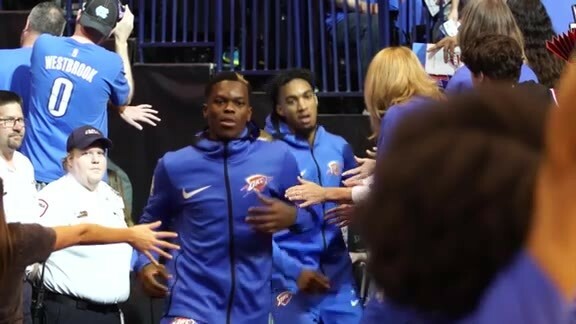 The Thunder was in position to take charge down the stretch because of a solid, steady half of play on both ends, but separation was gained during a 9-0 burst midway through the third quarter. Three Westbrook free throws, then a Westbrook to Alex Abrines three-pointer and a Westbrook to Steven Adams cutting and-one layup turned a tie ball game into a 72-63 Thunder advantage with just over 16 minutes remaining in regulation. It was a vintage Westbrook sequence as a part of a fantastic Westbrook performance, in which he shot 9-of-17 for 26 points to go with 15 rebounds, 13 assists and 2 steals. The triple-double was Westbrook’s 24th of the season, and 103rd of his career, and in this setting, with the postseason on the line, it was the reigning MVP who helped ensured the result. The other main factor was the Thunder’s defense, which wasn’t perfect but kept New Orleans in check in a few major categories, like rebounding and second chance points, in addition to the 21 turnovers forced. The way the Thunder rotated over from the weak side, particularly on Davis, forced the Pelicans into a flurry of miscues that helped keep the New Orleans offense from going off.